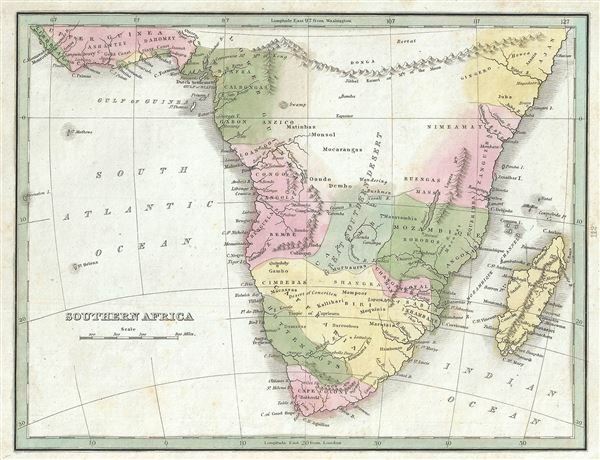 This interesting map of southern Africa was printed by the important American mapmaker T. G. Bradford in 1835. It covers the southern portion of Africa from Liberia to Cape Colony, including Madagascar. An interesting map issued just as most of the earth's non-Polar shores were finally explored. Inland though, much remained unknown. The present map exhibits various speculations regarding the unexplored interior of Africa. Several African tribes are identified throughout. Bradford maps the mythical 'Mountains of Kong' extending eastward to join with the 'Mountains of the Moon.' According to Ptolemy, the Mountains of the Moon lay near two great lakes that were source of the White Nile. Today some regard this range and its lakes as speculative. To the west of the Mountains of the Moon Bradford draws a long mountain range called the Mountains of Kong. This speculative range was proposed by the explorations of Mungo Parks and was presumed to be the southern barrier to the Niger River valley. South Africa, a more pleasing climate to the Europeans, was at the time actively and aggressively being colonized by both the Dutch and the English. The map was published as plate no. 112 in Thomas G. Bradford's 1835 Comprehensive Atlas Geographical, Historical and Commercial. Bradford's atlas, published in 1835 was an important work on many levels. First, it was one of the first American atlases to follow an encyclopedic format, offering readers extensive geographical and statistical tables to supplement the maps themselves. Second, it was published in Boston and influenced the city's rise as a publishing center later in the 19th century (at the time most publishing in the United States was restricted to New York and Philadelphia). Third, this atlas was the first to contain a separate and specific map showing the Republic of Texas. Fourth and finally, Bradford's atlas in some instances broke the Euro-centric mold regarding atlas production. Among other things, Bradford focused his atlas on the Americas and abandoned the classical decoration common in European atlases in favor of a more informational and inherently American approach.